Prior to the advent of steel and concrete as primary materials for constructing bridges, timber was the material of choice. Between 1810 and 1910, several thousand covered bridges were built throughout the United States. Today only about 850 remain, many having been lost to flood, hurricane, neglect, or fire. Of those that have been lost in recent years, the vast majority have been destroyed by fire, either accidentally or by arson. In 1992, three (3) covered bridges in New Hampshire were totally destroyed by arson. As a result of these incidents, the "New Hampshire Covered Bridge Task Force," was created. This task force consisted of federal, state, and local governmental agencies that had jurisdiction over covered bridges in New Hampshire. This paper, which is a continuation of the work prepared under the direction of the Covered Bridge Task Force, presents findings relative to the causes and resulting damage to over thirty (30) covered bridges and, based on these case studies, presents several methods that can be used to reduce the potential threat of damage or loss by fire. Experience gained by designing and installing fire protection and detection systems on seven (7) recent covered bridge replacement or rehabilitation projects is also presented. Fire protection and detection systems discussed include: fire retardant paint, heat detectors, sprinkler systems, alarms, lighting, and hydrants. Measures that can be taken by covered bridge owners to protect these historic structures from destruction due to fire are identified as follows: (1) deterrence; (2) reducing the fire potential; and (3) arresting the fire. The importance of each of these measures in discussed in depth as well as the advantages and disadvantages of each measure. Arresting the fire--measures taken to quickly extinguish a fire. In the past ten years there have been approximately thirty-four (34) covered bridge fires in the United States (see Table I). On average, there are one or two bridges lost to fire each year. There is much in common with these recent covered bridge fires. All were started by arsonists or were of suspicious origin, and started late at night. 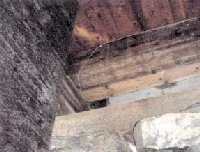 Few bridges had any systems to detect a fire or prevent a fire from being started. Most were poorly lit and some had no lighting at all. Some bridges were in remote locations and most were served by volunteer fire departments. Most bridges had been burning for some unknown period of time prior to notification and the fires had spread quickly and engulfed the entire structure. Almost all bridges were completely destroyed. Only ten (10) bridges of the thirty-four (34) bridges studied survived in a condition to be repaired. It is clear that arson is the cause of every covered bridge fire in the last ten years, and the lack of fire protection or detection methods on these bridges resulted in significant damage or total destruction. Smoke Detectors -- Experience has shown that smoke detectors can easily be set off by pranksters or by smoke resulting from the friction of tires against a timber bridge deck or from exhaust fumes from large trucks with upright exhaust stacks. Further, dust and dirt can accumulate at the openings of the detectors and either cause false alarms or cause the detector to become inoperable. If police and fire officials are repeatedly responding to false alarms, deterrence will become ineffective. Therefore, smoke detectors are not recommended for covered bridge applications. Flame Detectors-- Flame detectors are fire detection systems which have sensors which react with the infrared active gasses produced by the combustion of wood. They are suitable for open-air applications and have a second sensor which checks for typical interference sources. The range of a typical sensor is 30 feet with a 100°: range. Multiple sensors must be installed through the bridge which increases installation costs and sensors cannot be installed in all locations to give complete coverage of a bridge. Heat Detectors -- Heat Detectors, which automatically detect excessive heat created by a fire, can be installed underneath the bridge roof framing, preferably along the underside of the ridge line of the roof. Fire detection systems that utilize early warning linear heat detection technology are best suited for covered bridges and can withstand the harsh environments in which they must exist. This system utilizes a continuous loop of fixed temperature heat detection cable which responds to overheat and fire in the early ignition stages before the combustion process can generate smoke. The linear heat detection cable will detect an overheat condition or fire anywhere along its entire length. The cable may be installed along the bridge in areas not generally visible to the public, such as: roof area, under the roof peak, beneath the eaves, handrail areas, under deck areas, floor beams and bearings. The cable is available in several colors to blend in with the color of the bridge or timbers. ALARMS -- Audible alarms such as bells or horns, or visible strobe types alarms can be mounted at one or two locations on the bridge to warn the general public in the area of a fire, to deter a would-be-arsonist, or scare off a prankster intent on setting off fire detectors or sprinkler systems. Alarms can easily be activated by heat detectors or sprinkler systems. The effectiveness of audible alarms is severely diminished at remote sites. LIGHTING -- A well lit bridge and approaches can deter vandalism and arson. The entire length of the bridge and the entire length of any sidewalk should be illuminated. The installation of vandal-proof fixtures with metal halide or mercury vapor lamps is recommended. The approaches to a bridge should also be well illuminated by the use of conventional street lights mounted on utility poles. TELEMETERING -- Fire detection devices or sprinklers can be telemetered to activate an alarm at the local police or fire station. Informing the fire department through telemetering can substantially reduce the notice time and response time by the fire department once a fire has begun. VIDEO CAMERA -- The installation of a video camera monitoring system can be a deterrence (especially if signs are properly posted indicating its existence). In order for the camera to be effective, proper lighting on the bridge and approaches must be provided, as well as 24-hour monitoring of the camera. Video cameras at remote sites will also need to be protected against vandalism. It should be noted that video surveillance using tape backup will probably not aid in identifying suspects after a fire since a would be arsonist can easily disguise themselves and avoid recognition by the camera. 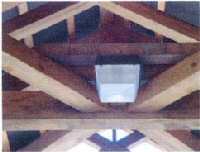 RETARDANT TREATED WOOD -- When building a new covered bridge or replacing timber members on an existing covered bridge, the timber used can be pressure treated with a fire retardant chemical which either prevents the wood from igniting by increasing the flame point or preventing the spread of the fire once a member has ignited. Retardant treated wood is most effective when used for siding, roof decking, and roof shingles. These thin elements are typically the easiest to ignite and tend to be the fuel for a covered bridge fire that can eventually destroy the main structural members of the bridge (i.e., truss members, floor beams, decking, and cross bracing). Fire retardant timber can also be used for main structural members such as trusses, decking and floor beams, either for new construction or for replacement of deteriorated or broken members. It should be noted that when pressure treated fire retardant timber is used as a structural member, the member's strength is reduced by approximately 10 to 20%. It should also be noted that the effectiveness of the retardant chemicals may be reduced over time if the timber members are not painted and subjected to surface loss of the retardant due to weathering. INTUMESCENT COATING -- There are several intumescent (fire retardant) coating products available for timber members. Both new covered bridges and existing covered bridges can be coated with an intumescent coating. When exposed to heat from a fire, the coating acts like an insulator to protect the timber member from the fire. These coatings come in a variety of colors including semi-transparent or clear finish. Thus, aesthetic concerns from a previously coated or uncoated covered bridges can be met. If an intumescent coating is to be used, it should be applied to all exposed surfaces of the bridge, including the inside of the roof deck, roof framing, top lateral bracing, trusses, underside of the decking, floor beams, and both inside and outside surfaces of the bridge siding. It should be noted that any coating system, especially one exposed to the elements or abrasion, will deteriorate and require periodic recoating. VANDAL-PROOFING -- Any measure taken to deter or prevent a fire on a bridge should also be as vandal-proof as possible in order to prevent an arsonist or prankster from disarming a system or from the system itself causing a fire. Any system that involves electrical wiring (fire detection systems, audible alarms, lighting and telemetering) should be protected in rigid galvanized steel conduit. Steel conduit not only provides protection for the cable, but it may prevent a would-be arsonist or prankster from cutting wires that would make the system inoperable. Further, insulation on wires not in a conduit can be damaged or be eaten by rodents, exposing the wires and causing a fire or system failure. Lighting fixtures should have heavy duty, vandal proof housings and should be UL listed for wet locations. Audible alarms or loud speakers should also meet these requirements and should be located at points on the bridge not easily accessible to vandals. 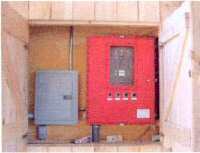 If possible, fire detection and sprinkler systems should be designed such that any attempt to defeat these systems by severing wires or vandalizing systems will set off alarms at the police or fire station indicating a system trouble condition. FIRE HYDRANTS -- If municipal water is available, fire hydrants should be located at both ends of the bridge. Hydrants should be located a sufficient distance from the ends of the bridge so that the intense heat and flames of a fire do not prevent access by the fire department. If municipal water is not available at or near the bridge site, then dry hydrants should be installed at both ends of the bridge. Again, dry hydrants should be located a sufficient distance from the ends of the bridge. Depending in the vertical distance from the river to the roadway, pumper trucks may not be able to lift (draw) water at a sufficient rate without the assistance of a submersible pump. If the lift is too high, a pump site down near the river should be made accessible for either motorized fire apparatus or for portable fire pumps. SPRINKLER SYSTEM -- A sprinkler system is a proven means or retarding the spread of fire once started. It is also a means of assisting a Fire Department in extinguishing a fire since, in most cases, the middle of the bridge will be inaccessible once the bridge is engulfed in flames. Because covered bridges are exposed to the elements, a dry valve sprinkler system and valve house should be installed to avoid pipe freezing and bursting. 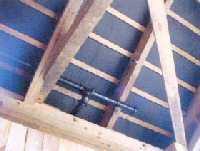 Sprinkler heads should be located along the inside of the roof on the bridge with the direction of spray downward and also located along the underside of the deck with the direction of spray upward. The location, number and spacing of sprinkler heads will vary depending on the width and length of the bridge and the critical areas to be covered for protection. If municipal water is available on site, then the sprinkler system can be charged automatically from a water line. The fire department siamese connections, to enable the fire department to supplement the system once they arrive on site, should be located at both ends of the bridge and be a sufficient distance away from the bridge to allow access by the fire department during a fire. Fittings to charge the sprinkler system should be located a sufficient distance from the ends of the bridge. If municipal water is not available, and electric or fuel-fired pump and pump house can be constructed at the site to draw water from the river and provide an adequate water supply to the system is a fire starts. The pump should be appropriately sized and accommodations made to provide a sufficient water supply for the fire department to use as a supplement source or water. A heated pump house or underground structure must be provided in order to prevent freeze-up of the system during the winter months. There are a number of factors that affect which protection or prevention methods should be employed and affect the cost of installing one or more systems. Each bridge is different and has its own unique requirements for fire protection. Further, some bridges are more susceptible to arson than others due to location and openness of bridge construction. Length and width of bridge. Availability of municipal water or surface water source at the bridge. Aesthetic and historic considerations on existing bridges and desired aesthetics on new bridges. Distance from site to electrical/telephone lines. Capabilities of local fire department, police department, and public works department. Based on experience gained by analyzing numerous covered bridge fires and specifying and constructing fire prevention and detection systems, several measures are routinely recommended for all covered bridge applications. A review of the nature of over thirty (30) recent covered bridge fires indicates all were started by arsonists or were of a suspicious nature. Fires on covered bridges almost always result in the complete destruction of the bridge. The most important approach to preventing a fire is deterrence. Deterrence is the first line of defense, as well as the most cost effective approach. The second line of defense is reducing the fire hazard. Although more costly than deterrence (especially on existing bridges), it can be effective in arresting a fire once started or limiting the extent of damage by fire. The third and final line of defense is reducing the fire department notification and response time to the site, as well as providing means of assisting the fire department to quickly extinguishing the fire. This last measure, if provided without any measures for deterrence or reducing the fire hazard, will not provide a level of protection that will prevent severe damage or a total loss of a bridge. The cost of providing fire protection measures ranges from as little as $2,500 to as much as $47,300 or more, for a typical bridge, depending on the number or measures taken and the extent of coverage provided. The cost of constructing a new covered bridge after one has been destroyed by fire can range from $400,000 to 1,500,000, depending on the size of the bridge being built and the load capacity being provided. Thus, the cost of providing some form or fire protection typically ranges from 3% to 15% of the new construction cost. This one-time expense is small compared to the over all replacement cost and thus is a cost effective means of protecting the bridge against fire. Municipalities can receive a discount on their insurance premiums if some of these measures are installed. When considering fire protection measures, aesthetics must be considered in order to not significantly deter from the historic fabric of the structure. Further, any measure taken should in itself be vandal-proof or a vandal-resistant as possible. There are several factors that effect which protection measure or measures are best suited for a particular bridge. Each bridge is different and has its own unique requirements for fire prevention. Covered bridge owners should seek the services of a professional consultant experienced in design of these systems to evaluate the needs and best solution to each bridge. The author wishes to acknowledge with grateful appreciation the many contributions made by public officials, fire fighters, historians, and system vendors, during the rehabilitation of numerous covered bridges, and in preparing this paper. 1. Durfee, Robert H., P.E., "Fire Protection and Fire Prevention on Covered Bridges", 1993.